Saturday May 23rd 1896 I took up the carpet in Seths room and cleaned the store room upstairs before noon. Will helped me put the carpet down after dinner before he went to town. I swept the middle room up stairs and cut up a lot of carpet rags before bed-time. There was a heavy rain late in the afternoon. Ott baby is two years old today. 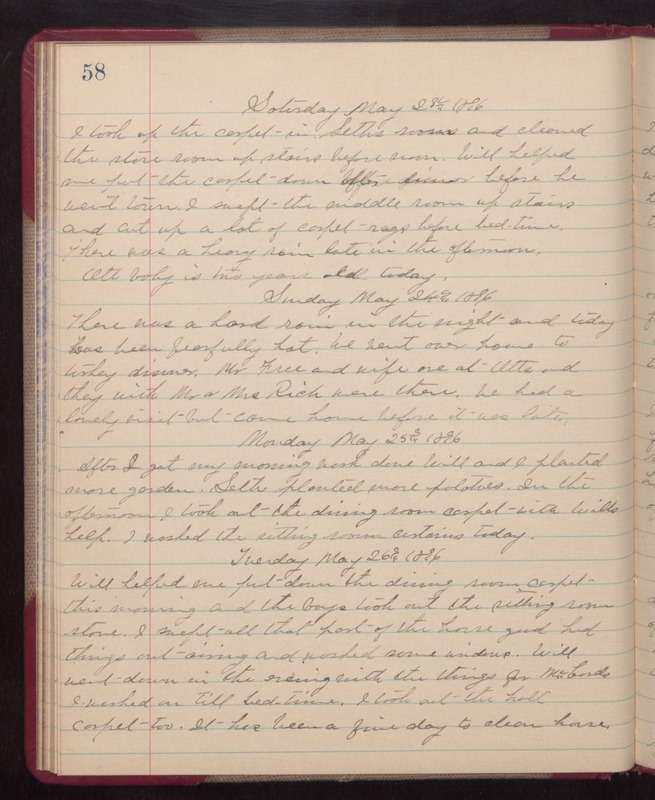 Sunday May 24th 1896 There was a hard rain i the night and today has been fearfully hot. We went over home to turkey dinner. Mr Free and wife are at Otts and they with Mr & Mrs Rich were there, We had a lovely visit but came home before it was late. Monday May 25th 1896 After I got my morning work done Will and I planted more garden. Seth planted more potatoes. In the afternoon I took out the dining room carpet with Wills help. I washed the sitting room curtains today. Tuesday May 26th 1896 Will helped me put down the dining room carpet this morning and the boys took out the sitting room stove. I swept all that part of the house good had things out airing and washed some windows. Will went down in the evening with the things for McCords I worked on till bed-time. I took out the hall carpet too. It has been a fine day to clean house.